The table was a large one, but the three were all crowded together at one corner of it. "No room! No room!" they cried out when they saw Alice coming. "There's plenty of room!" said Alice indignantly, and she sat down in a large arm-chair4 at one end of the table. "Come, we shall have some fun now!" thought Alice. "I'm glad they've begun asking riddles  I believe I can guess that," she added aloud. "It is the same thing with you," said the Hatter, and here the conversation dropped, and the party sat silent for a minute, while Alice thought over all she could remember about ravens and writing-desks9, which wasn't much. "Two days wrong!" sighed the Hatter. "I told you butter wouldn't suit the works! "10 he added, looking angrily at the March Hare. The March Hare took the watch and looked at it gloomily: then he dipped it into his cup of tea, and looked at it again: but he could think of nothing better to say than his first remark, "It was the best. butter, you know." "Why should it?" muttered the Hatter. "Does your watch tell what year it is?" "If you knew Time as well as I do," said the Hatter, "you wouldn't talk about wasting it. It's him13"
"Perhaps not," Alice cautiously replied; "but I know I have to beat14 time when I learn music." "That would be grand, certainly," said Alice thoughtfully; "but then  I shouldn't be hungry for it, you know." Like a tea-tray17 in the sky. Here the Dormouse shook itself, and began singing in its sleep "Twinkle, twinkle, twinkle, twinkle " and went on so long that they had to pinch it to make it stop. 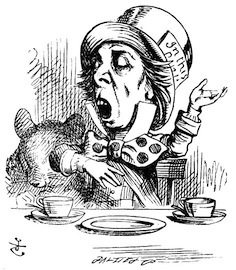 "Well, I'd hardly finished the first verse," said the Hatter, "when the Queen bawled out 'He's murdering the time! Off with his head!" "And ever since that," the Hatter went on in a mournful tone, "he wo'n't do a thing I ask! It's always six o'clock now." "They lived on treacle,"19 said the Dormouse, after thinking a minute or two. Alice tried to fancy to herself what such an extraordinary way of living would be like, but it puzzled her too much: so she went on: "But why did they live at the bottom of a well?" "You mean you ca'n't take less," said the Hatter: "it's very easy to take more than nothing." Who's making personal remarks now?" the Hatter asked triumphantly. "There's no such thing! "22 Alice was beginning very angrily, but the Hatter and the March Hare went "Sh! Sh!" and the Dormouse sulkily remarked. "If you ca'n't be civil, you'd better finish the story for yourself." ""No, please go on!" Alice said very humbly. "I wo'n't interrupt you again. I dare say there may be one." "One, indeed!" said the Dormouse indignantly. However, he consented to go on. "And so these three little sisters  they were learning to draw,23 you know "
Alice did not wish to offend the Dormouse again, so she began cautiously: "But I don't understand. Where did they draw the treacle from?" "You can draw water out a water-well," said the Hatter; "so I should think you could draw treacle out of a treacle-well  eh, stupid?" 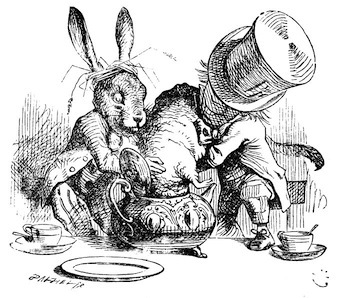 "They were learning to draw," the Dormouse went on, yawning and rubbing its eyes, for it was getting very sleepy; "and they drew all manner of things  everything that begins with an M "
The Dormouse had closed its eyes by this time, and was going off in a doze; but, on being pinched by the Hatter, it woke up again with a little shriek, and went on: " that begins with an M, such as mouse-traps, and the moon, and memory, and muchness  you know you say things are 'much of a muchness'  did you ever see such a thing as a drawing of a muchness!" "Really, now you ask me," said Alice, very much confused, "I don't think "
Just as she said this, she noticed that one of the trees had a door leading right into it.24 "That's very curious!" she thought. "But everything's curious to-day. I think I may as well go in at once." And in she went. Once more she found herself in the long hall, and close to the little glass table. "Now, I'll manage better this time," she said to herself, and began by taking the little golden key, and unlocking the door that led into the garden. Then she set to work nibbling at the mushroom (she had kept a piece of it in her pocket) till she was about a foot high: then she walked down the little passage25: and then  she found herself at last in the beautiful garden, among the bright flower-beds and the cool fountains. 'Tea' being considerably more than just the beverage today so firmly associated with the chinese, japanese, and english in this case. British 'formal tea' is the event many of us in former british colonies associate with tea cups and saucers, with formal servings and tidy little cookies or sandwiches. Later the term came to refer to a light meal eaten in the mid-afternoon with or without drinking tea, because originally it was customary not to eat dinner until later in the evening. The characters here are having afternoon tea with many of the more formal accoutrements, including cups and saucers. 'Dormouse' is a term for a range of asian and african rodents that have in common their mouse-like appearance or size, but a furry rather than scaly tail. They apparently evolved in hot climes, and when they live in places with a more varied climate like england, can hibernate for as long as the weather is cool enough, waking up occasionally to eat stored food. In other words, in cool weather english dormice react similarly to reptiles; they get sleepy. England is rather a cool place even in good weather  or at least it was until today's climate change, which has brought with it much hotter summers and the potential for heat waves like that the country suffered in 2006. So this is a mad tea party in both senses of the word. 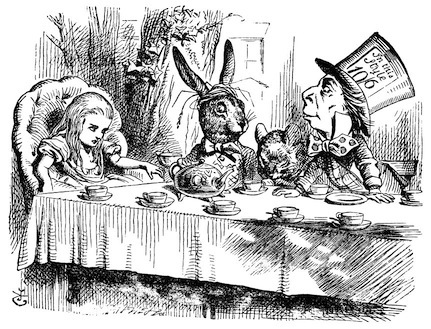 An interesting aspect of this interlude is that during the tea party is when Alice shows herself finally ready to contradict and even scold the animals or the peculiar child-sized adults she meets. Currently offering a child wine whether it was there or not would be considered seriously inappropriate, and even allowing children to taste wine is widely frowned on. This has probably been generally true for human history in general, as any substance that affects the mind and emotions is generally deemed dangerous to a young and still growing person. All that said, it is ironic that in the victorian era practically all 'patent medicines', commonly used as home remedies for illnesses or at the direction of a doctor consisted mostly of alcohol with flavouring, and were often given or prescribed for children. Today 'gripewater' is one of the patent medicine holdovers, consisting mainly of mint flavouring and alcohol, although non-alcoholic versions are now available. Another mathematical reference, this one to the commutative law which states that it doesn't matter which order you multiply or add numbers in, the result will be the same. While this works well in mathematical language, bound about as it is by much stricter rules than most human languages, it doesn't apply in english at all. Arguably it could be made to apply to languages that use case markings, such as latin or greek, because the case endings allow words to be stated in any order in some utterances. Only 'some' because in both languages there are words that are not permitted to be in certain positions when they are used. While it is self-evident that you have to breathe when you sleep just as you do when you're awake, breathing problems while sleeping are surprisingly common. The best known manifestation of such trouble is snoring, followed by sleep apnea, of which snoring is a common warning symptom. Sleep apnea is a situation in which the sleeping person stops breathing for short periods; the periods are not long enough necessarily to wake them up, but they disrupt the cycle of brain states involved in a good night's sleep, leading to chronic exhaustion until the condition is treated. There are several types of desks designed for different types of work. A 'writing-desk' is one with a top that can be rolled up, propped up, or folded back from a cavity with the actual writing materials in it. You could be writing something, and rather than tidy away all the papers simply close the top. The usual version of a roll-top desk is less utilitarian because the closed top isn't flat, rendering the desk useless for any other purpose. The other most familiar type of desk is the student desk, ranging from the nasty one piece desk and chair affairs in many classrooms to larger units with several drawers and a flat top. Older elementary school student desks included a hole in the top right corner, intended to correspond to where a student would place their ink bottle. Such older desks can still be found in many rural and not so rural schools in canada. 'The works' being the tiny gears and springs inside a pocket watch. Pocket watches have become relatively rare, those that need to be wound once a day even more so. Remarkably, if you do find a wind-up pocket watch as opposed to a kinetically wound pocket watch (which would be very expensive if it exists as all kinetically wound watches are), what you'll be looking at is very probably a close replica of the very sort of pocket watch commonly worn by men in the victorian era. The best place to find such watches is an engraving shop rather than a watch shop, especially if you aren't looking to spend over a hundred dollars. Such a watch would have an all manner of problems with losing days throughout the year if it wasn't electronic, especially if the watch keeper was using one of the 'western' calendars with their irregular month lengths. You may object that not so long ago there were watches that showed the current date, including the day of the week and the month, in one or two little windows. In that case it would just take a great deal longer to lose two days, just over fourteen months because such watches couldn't account for leap years on their own. The watch owner would have to reset them. I have a digital watch that like its many compatriots shows the year; the two-digit year. Remarkably, despite a considerable amount of programming in it which allows it to track two different time zones, two alarms, obnoxious hourly beeps, count laps, and one other function I have never understood (and yes, I did RTFM), it is unable to deal with leap years. The images of 'old father time' are proverbial in northern english-speaking areas, derived in part from the greek deity Chronus who was the personification of time. He was not the same character as Cronus, infamous as an eater of his own children and inspirer of several hideous paintings, the most famous of which is probably by Goya, although the image by Rubens is the more immediately disturbing. 'Beating time' can seem like the primary task of a junior high music teacher once the students have learnt to read music and the basics of playing their instruments. You can tell when the students are at this stage, because just managing the instruments and keeping track of the beat effectively prevents them from playing together and they all sound out of tune. Time is a matter of perception, as anyone who has experienced time running fast during fun activities or when struggling to finish work ahead of a deadline. It seems like a thing existing outside of us because we have become used to living by an externally imposed 'universal' clock. Yet without some kind of measuring device, be it artificial or natural phenomena, we would have no specific idea of time passing. Since people age differently and can age at different rates, it wouldn't be possible to agree on a universal time scale, unless someone was chosen out to serve as the clock, and then a new person would have to be chosen as the previous 'clock' died. If people didn't age, it's hard to say if we'd have a sense of time passing at all, unless we gauged it by new experiences or changes in our thoughts or beliefs, and there again we could never agree because changes in our own minds are among the hardest to recognize. 'Dinner' evidently corresponding roughly to what would be called 'lunch' in terms of time of day in much of north america. The word generally means 'the main meal of the day' and until quite recently that was what this mid to early afternoon meal was. Today in canada at least 'dinner' is generally the evening meal, although this is changing as more people rediscover that having a heavy meal before going to sleep for from four to eight hours is rarely a good idea. Tea trays are rarely seen in north america, although they were once common. In english use, they would be the means of bringing a pot of tea, the milk jug, a bowl of sugar, and a bowl of lemon slices out to the tea drinkers. There are also special tea trays used in asian tea ceremonies  mind you, it would be more accurate to say that the original tea trays are part of the paraphernalia of asian tea ceremonies. As is now well known, Elsie, Lacie, and Tillie are manifestations of Alice Liddell and her sisters. 'Well' is an Old English word for a spring, so it is actually possible to live at or near a well, although not at the bottom of one. 'Treacle' is a substance with a remarkable and awful history. Originally the word referred to a substance that could cure any illness, disease, or poisoning. Once people became aware that there was another sweet substance in the world besides honey, sugar soon became popular as well as expensive. As an early large-scale cash crop, it was a key inspirer of get-rich-quick schemes and an important excuse used for expanding the slave trade and invading other countries to set up sugar plantations wherever the local climate allowed. To be used conveniently, the sugar needed to be refined, typically involving mascerating sugar cane or beets, squeezing out the juices, then boiling them in order to cause the sugar to crystallize. The crystals could then be collected. After that they could be treated in other ways to create blocks or cubes, or to make the sugar look whiter. 'White' sugar is actually coloured with dyes; without them it would look a pale yellow. The syrup left over from refining the sugar could still be quite sweet, depending how long it was cooked and how many crystals were extracted from it. Treacle corresponds to what in canada is called 'golden syrup' and may have been used in preparing medicinal syrups since it could cover at least some of the taste of the other ingredients. Or, as anyone who has watched Disney's Mary Poppins knows, 'a spoonful of sugar helps the medicine go down.' 'Black treacle', the syrup remaining after the majority of the sugar has been extracted or cooked into caramel is known as molasses in Canada, and was a staple of poor families into the 1960s, when it would serve as pancake syrup (it's quite good for that, actually). Considering what the word 'treacle' once meant, this is marvelously ironic. On one hand, if they lived on sugar syrup, our well dwellers would be quite sick; on the other, if they were chronically ill they could be treated with the original treacle! Yet another mathematical reference, this time to the concept of negative numbers. There was a time when they were considered disreputable and nonsensical, because numbers hadn't yet become abstracted from marking quantities of specific things or people. Denise Schmandt-Besserat has shown that the origins of Sumerian cuneiform lie not in pictograms so much as in counters and tallies used to track quantities of goods. Negative numbers feature in another set of still somewhat disreputable numbers, the imaginary and complex numbers. They feature the number i, which represents the square root of -1. If you read the novelisation of the Doctor Who episode The Twin Dilemma (one of the worst episodes of the show's original run), you will learn that author Eric Saward considers such numbers nonsense. Nonetheless, those numbers have proved highly useful in describing waves, helping to make many of our electronic devices possible. The celts saw wells as sacred and the particular places where their beloved Goddess Brigid manifested as a healer, especially of eye problems. Springs, particularly ones that are naturally warm or hot were seen in the same way. In other words, Celts invented the spa! Drawing being what you do from wells, of course! False doors have been painted and carved in some remarkable places. Some of the most famous are in ancient egyptian temples and tombs, where they marked a way between the world of the living and the world of the dead. An area for leaving offerings and saying prayers for the dead was often set up in front of them. Less well known but all the stranger are the false doors carved into sheer cliffs on either side of the Terme Çay river in Turkey. Doors have been perennially associated with different states of consciousness, as well as 'the doors of perception' (pace William Blake and the Doors), which puts this tree door in good company. For those keeping track, the door to the garden is about 15 inches high.